ACT Forklift: Created Equal? Not Really! Why are there so many forklift manufacturers? Not all forklifts are created equal, and certainly not all applications are the same. Manitou offers a full line of industrial forklifts that share similar capacities, options, and basic operation as most other forklifts on the market. 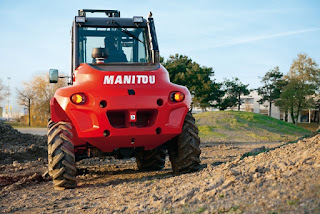 However, the Manitou is created to thrive in areas and applications where ground conditions are not always ideal. As shown in the picture below, the Manitou works well in outside area where normal forklifts do not dare consider travel. The Manitou shown here is a rough terrain mast forklift that offers superior ground clearance, tractor type tires, and even four wheel drive where needed. The forklift in this picture shows a lift that is loaded with items that are needed in the not so perfect world of outdoor material handling. You can see the additional clearance and larger tires, but maybe not so easy to see are the other items that can make this forklift a "must have" for yard work in not so perfect weather conditions. The operator is sage and dry in a cab. The cab has defrost, wipers on the front and back, rear work lights, recessed running lights in the counterweight, and even a draw pin if you need to pull someone or something out of a ditch. While this model is complete overkill for warehouse dock environment, it is right at home in the yard on pavement, gravel, or dirt. Manitou does not make a forklift for dock, stock, and rack aisle type work with narrow aisles and controlled conditions. So, ACT carries several lines of forklifts to meet the varying needs of our customer applications. We strive to always provide experience based solutions at ACT, and having products that bring solutions, reduce customer expenses, and provide return on investment help us meet that goal. For more details on experience based solutions, visit our website at www.actforklift.com.